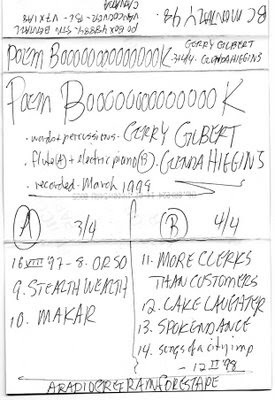 Most of the show was my recording of a 7 March 1995 reading by Fredericton's Tracy Brooks and Colin Morton from Ottawa. [photo by Danielle Schaub] with Colin mainly reading from The Merbook: Kurt Schwitters Poems and from the novel Oceans Apart. "Rant Against Otherness" by Klyde Brooks. a friend of Rachel Noel, Hair–Makeup–Wardrobe. The question put to me by Art was could I make a gauntlet? 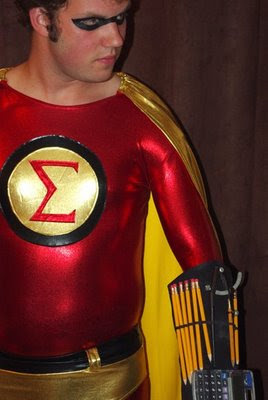 Math geek trying to be fly at a school dance. 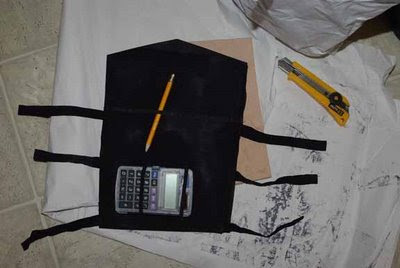 a calculator and my choice of compass . 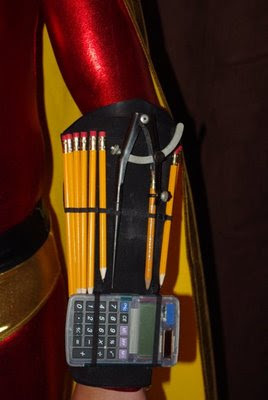 . .
Super Geek Math Boy armed. 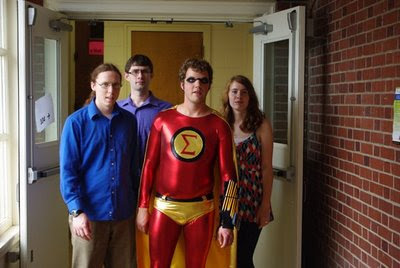 Super Geek Math Boy and the Geek Posse! 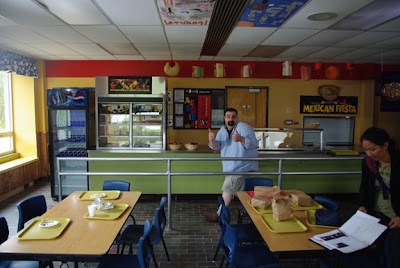 Art Thomson, Artistic Director of the Art Depart and Bunthivy Nou, Producer–Director of the film, on the cafeteria set (in Naswaaksis Middle School). 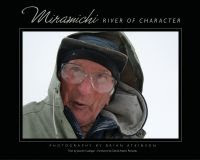 Show started with a live interview with photographer Brian Atkinson discussing his new book Miramichi: River of Character (Goose Lane Editions & MC2 Marketing Inc) by Brian Atkinson with text by Joanne Cadogan, and their book launch in Fredericton at 5:30 pm, Thursday, 25 June 2009, at Westminster Books, 445 King Street. Show continued with a tribute to Vancouver poet Gerry Gilbert who passed away on, I believe, 19 June 2009. I have one recording of his (wth musical accompaniment by Glenda Higgins), from March 1998. Poems broadcast were: "More Clerks than Customers", "Lake Laughter", "Spoken Dance", & "Songs of a City Imp". "Do you have anything a little less totalitarian?" by Vincent Tinguely. A jet-lagged show . 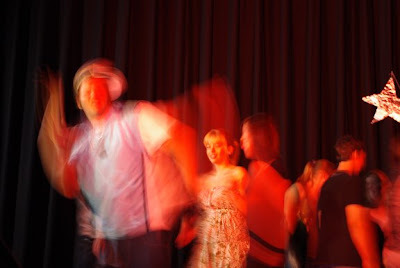 . .
First half was from my recording of Heather Spears reading from Poems Selected and New (Wolsak & Wynn) at Gallery ConneXion, 24 April 1999. 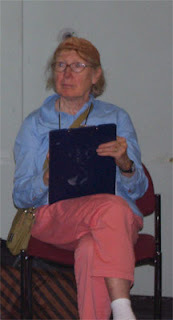 Photo of Heather from the LCP Poetry Festival & Conference, 12-14 June 2009, Vancouver, NB; by Joe Blades. 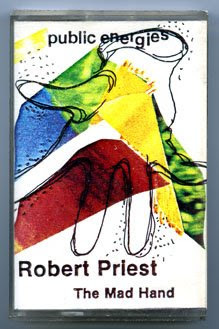 Poet Robert Priest's cassette The Mad Hand (Public Energies, 1985). 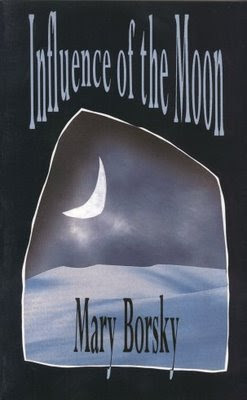 Feature in the first half: Ottawa writer Mary Borsky reading a short story from her book Influence of the Moon. In `Map of the Known World,' 16-year-old Irene's growing independence asserts itself most forcefully when she refuses to agree to an arranged marriage with an older Ukrainian man, jumping off the school roof to make her point. The show's second half featured Montreal poets Steve Luxton reading four poems and Oana Avasilichioaei reading "The Tea Party" and "Love Story. Both readings were part of the Atwater [Library] Poetry Project. For editing purposes, one's own revising and working with outside editors at journals, newspapers and book publishers, marking and tracking suggested changes is vital. While it is the practice of many to do some form of editing and proofing of the manuscript, it's really simple to use the "track changes" function in MS Word. You need to have the "track changes" function on. I already described how to go into the [Tools] dropdown menu. "Accept or Reject changes" is the feature in "track changes" to do just what it says. Please use it or print out a hard copy of manuscript. "Replace" is a great feature. So is "delete." Both work in Word and WordPerfect, even in InDesign. I absolutely dislike not having a hard copy to work from, to compare layout to, especially when you've used not-my-computer-here to fake the poems and the pages to look somewhat like how you want the published poems to appear. Prob is that we have different computers, different default printers, likely different fonts. Whenever I open a text file here they adjust to my computer system and they do not, cannot appear exactly as what you see/saw on screen---that's what a hard copy manuscript is so vitally important when also sending a digital manuscript. Please use a dictionary not just computer-based spellcheckers. Most publishers will gladly share their prefered dictionarys and style guides. My prefered dictionary is the Oxford Canadian. I do not like seeing fake page headers instead of using that easy function within WordPerfect, auto page numbering too. I can see the where and why of the left side "garbage and tabs and hard centering problems. In WordPerfect press the [F3] key to reveal the hidden coding. Far too many lines don't have a Hard Return or Line Break at their end--just a string of spaces until the words wrap onto the next line (when all you needed to do was hit [enter] for a hard return. Page breaks are an equally simple [Ctrl][Enter]. 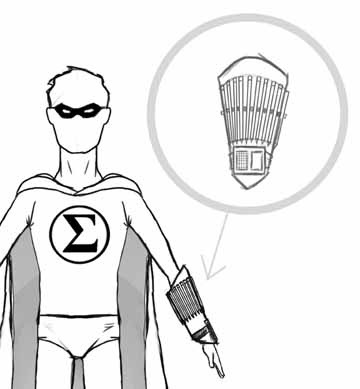 Heaters and Footers are found in the Insert drop-down menu. Page numbers are in the Format / Page / dropdown menu. Two months after the fire . . . The burnt-out building still stands. Broken glass litters the ground and sidewalks around it. Vehicles fill the parking lot daily. All the basement windows have been sealed with sheets of plywood and someone has even tried to rip those off. Pigeons roost on the burnt rafters. From the street, as I bicycle past it, I can smell the mould and the burnt-everything residue. Honestly, if for nothing but safety concerns, why hasn't the building been demolished? Five-weeks into a new home I'm still somewhat mixed and still messed enuf to not be sleeping well every night. Many nights, but not all. Wake often, especially around 2:30 am (the time that night), and far too early (w/ the 4:30 am robins) then want to and can sleep again at 10 am. Still have over 40 movers' boxes of books (the library) and other stuff---mostly in the basement storage room. Hand scrubbing the smoke off furniture and dishes is slow and annoying. Replacing everything electric or electronic is too expensive for me to want to undertake all at once (but I've dropped several K on a new 'puter, scanner, printer, software & accessories). Haven't replaced any power tools yet. Have most of my late Gram's kitchen appliances plus her dining room set, china cabinet, loveseat (give to me in the '70s), bedding, towels, bakeware, etc. Am trying to get back on track. Have an office workspace that's good; larger rooms and more room; a recessed balcony with furniture & plants . . .
Special thanks to Cat & Tony for loaning their car several days, to Liz and her truck for hauling all the plants and more . . . especially to and from the interim hotel rooms, and to Beth for use of her car. Thanks to my parents to the furniture and dishes and for being on the lookout for more things. Thanks to Ken for the signed replacement copy of his book; to Maggie for her book, prayer and piece of spiritual palm; to Wolsak & Wynn for the set of three Jeanette Lynes poetry books including her new one, The New Blue Distance—the second of hers to have a Glen Priestly painting repro'd on the cover. Thanks to John, Ruth and Brian for an assortment of useful desks. Thanks also to Pierre and Paul; to Jackie for some dried spices and herb plants—especially the bay and lemongrass; to Cynthia for some work . . . All these things have made a great difference in getting resettled. 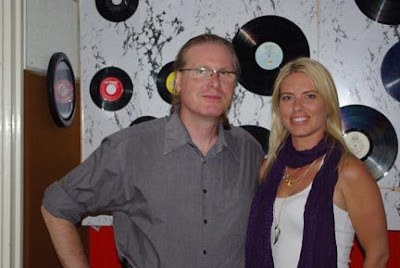 The show started with my live interview with actor Angela Cullins---native of Hartland, NB, and lead actress in the just-finished-filming-in-Fredericton American Sunset feature film---and with Jim Lavoie---part actor, publicist, journalist (see/read his articles in the new [here] later this week). 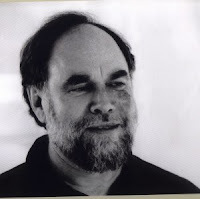 Second half of the program was from a 16 October 1998 recording of New Brunswick novelist David Adams Richards reading from The Bay of Love and Sorrow at Gallery ConneXion. Ashes, Paper & Beans, 7-8 pm, Tuesdays, on CHSR 97.9 FM in Fredericton. 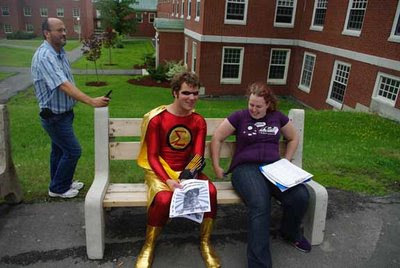 Listen online at www.chsrfm.ca from elsewhere on Earth. Ashes, Paper & Beans episodes are reproadcast at other times in the station's programming schedule but are not yet available as podcasts.